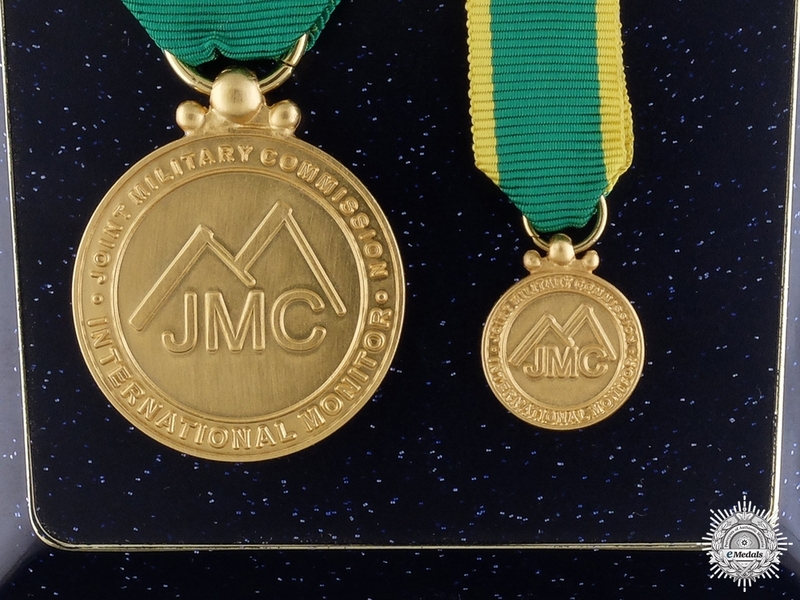 A Joint Military Commission Monitor Medal for the Nuba Mountains in Sudan - Gold-coloured gilt on metal, obverse illustrating the JMC insignia in the centre, inscribed "JOINT MILITARY COMMISSION" above and "INTERNATIONAL MONITOR" below, reverse illustrating a map of Sudan in the centre, inscribed "JOINT MILITARY COMMISSION" above and NUBA MOUNTAINS - SUDAN" below, Fullsize: 33 mm, Miniature: 16 mm, on original ribbons with safety pin attachments, accompanied by their 10 mm x 35.3 mm ribbon bar, in their plastic case of issue, near mint. Footnote: Sudan had been engulfed in a civil conflict in southern Sudan since 1983, with some twenty of twenty-six states affected by war. As part of the peace process underway since 2002, the Government of Sudan (GoS) and the Sudan People’s Liberation Movement/Army (SPLM/A) signed the Nuba Mountains Cease-Fire Agreement (CFA) on January 19, 2002. They agreed to an internationally monitored cease-fire between their forces in the Nuba Mountains for a renewable period of six months, with the broader objective of promoting a just, peaceful and comprehensive settlement of the conflict. The CFA, together with a Status of Mission Agreement (SOMA), provided for the Joint Military Commission (JMC), which became operational in April 2002. The United Nations Security Council subsequently welcomed the establishment of the JMC and other monitoring mechanisms in Sudan. 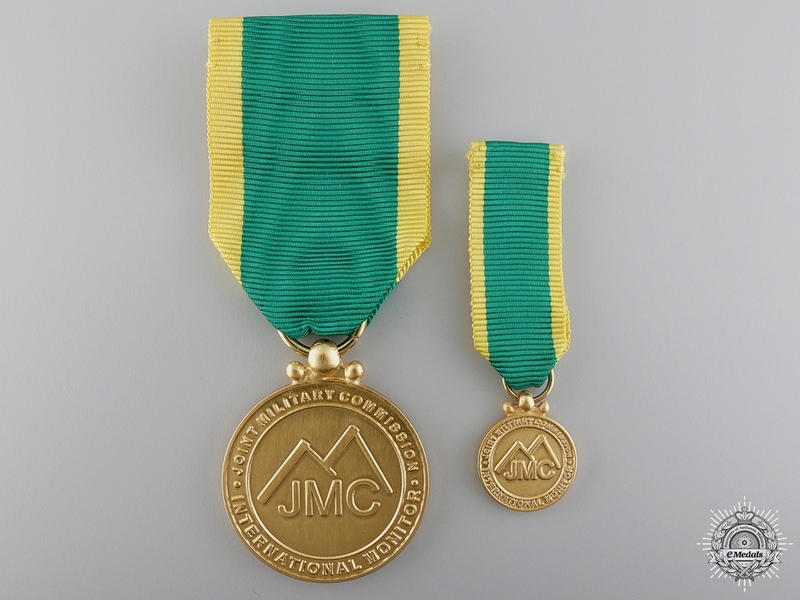 What was commonly called "the JMC" consisted in fact of two entities: the International Joint Monitoring Mission (JMM), which monitored compliance with the Cease-Fire Agreement and assisted in the disengagement and redeployment of combatants, and the JMC proper, also called the Chairman’s Group, which decided whether an action constituted a cease-fire violation or not. The JMC Head of Mission had command and control over the joint monitoring teams, and simultaneously acted as the Chairman of the Chairman’s Group. Political support for the JMC was provided by the Parties, who together provided two-thirds of the JMC monitors. In addition, the JMC was supported by the Friends of Nuba Mountains (FoNM), a group of twelve European and North American countries that funded the JMC and provided its unarmed international monitors. 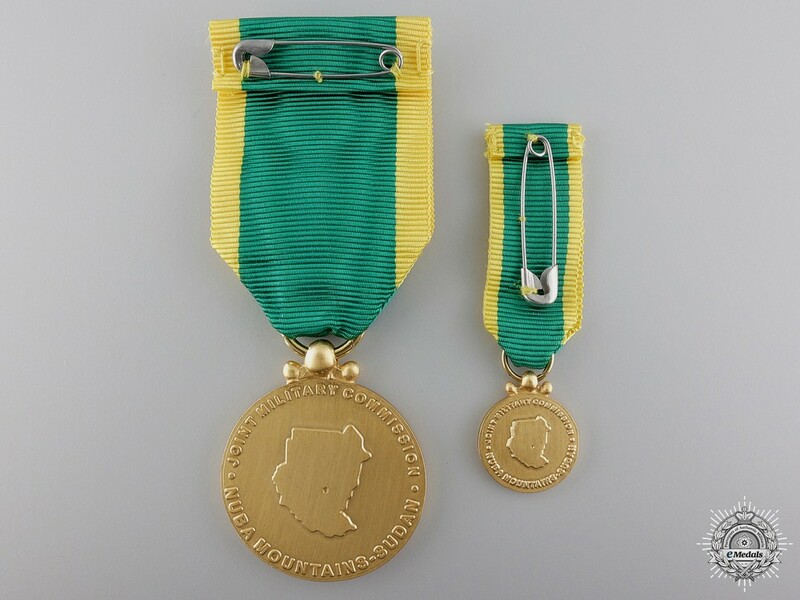 The twelve countries included: the United Kingdom (Chair), the United States, Norway, the Netherlands, Sweden, Switzerland, France, Italy, Germany, Canada, Denmark and Belgium. All these countries contributed personnel and/or funds to the JMC. They have renewed the agreement every six months, while attempting to reach a comprehensive peace agreement. Further peace talks, held in Kenya, resulted in the signing in October 2002 of the Machakos Memorandum of Understanding on Cessation of Hostilities, which was renewed for another three months on September 1, 2004. Both agreements prohibit the government of Sudan and the SPLM/A from using landmines. The Nuba Mountains agreement has been considered a model of cross-line mine action in Sudan, which could be replicated in other places in the country. 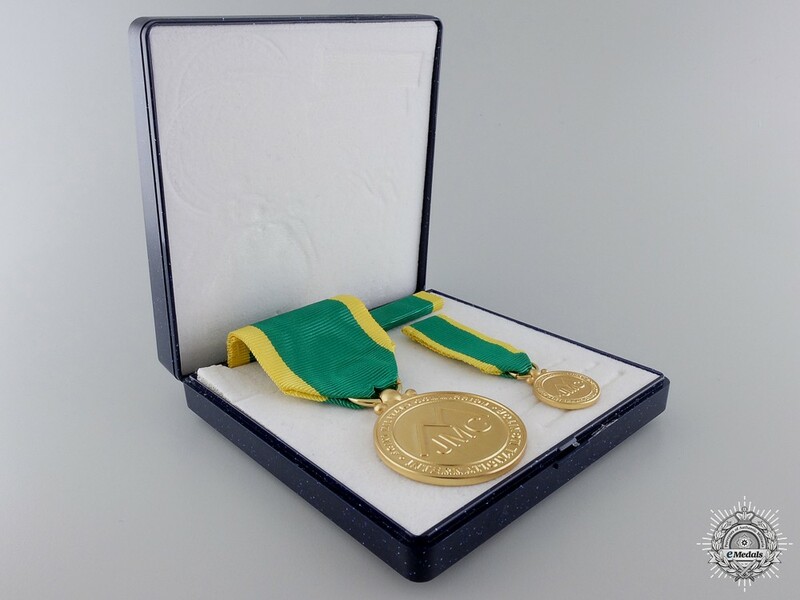 The medal presented here was awarded to a Canadian recipient, the only Canadian to receive the medal.